Well no sense in straying too far from the mark; we’re going to tackle another Tokyo Shock production. This time we’re looking at the very first Shock picture I ever saw, and boy was I spoiled. I used to check out this site, Veoh, and one day I happened upon a little Thumbnail that said “Versus,” and I had no idea what was in store for me. 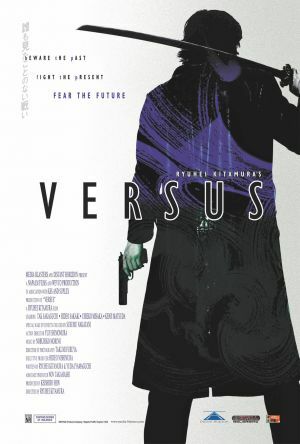 A lot of both action and horror movies come out of Japan, and Versus is really one of those special combinations that shouldn’t be passed up. 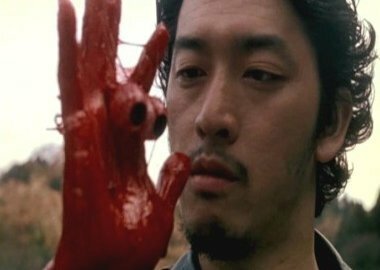 The film was released in 2000 and was directed by Ryuhei Kitamura. 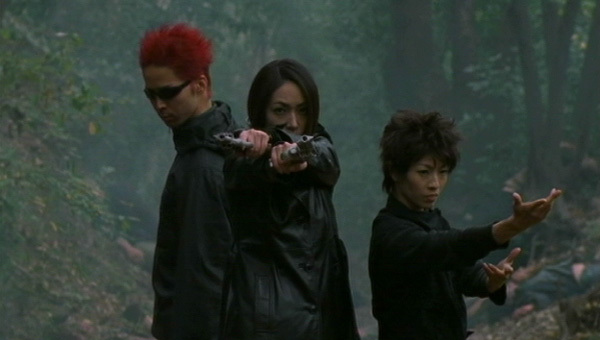 Originally Kitamura intended to do a sequel to his film, Down to Hell, but somewhere down the line there was a disagreement regarding whether or not a Japanese action film could compare with an American one. The result was that Kitamura found a lot of inspiration from classic 80’s genre films such as Mad Max and Evil Dead. He felt traditional special effects were missing from modern action/horror and felt that traditional effects could bring impact and power to the screen without being overly expensive to produce. He also felt that filming with one or two cameras would make things a lot cheaper and allow more continuous shots with less cuts (in the style of older Asian cinema). One thing that I found strange was that he claimed not to like a lot of Japanese animation or things of the sort. I find this odd because when I first saw it, I honestly felt like I was watching a live action anime or videogame. Kitamura also has a reputation for disliking the film industry. He chose his cast based on their looks or if he had worked with them before rather than their skill. He works with story boards but never follows them completely and, furthermore, he’ll completely change an actor’s role in the film if he likes them and they are doing a good job. He said he wanted to make a movie that was really simple, which might be why none of the characters really have names. There is not a lot of character detail or full explanations about why certain characters are even there. He felt that action and horror films from the 80’s had it right, that they were there to entertain and not try to be something they aren’t. Okay, so the idea behind that film is that there is a forest known as the forest of resurrection. It’s essentially a gateway from this world and the “other world,” so I would assume they mean the afterlife. It starts off with two prisoners escaping into the woods to meet up with a bunch of gangsters. Things get tense quickly and people start dying, and then coming back to life. It seems that because they are in the forest of resurrection at this specific time, the dead will rise. The gangsters also have a girl in their possession for no reason other than their “boss” desired it. Prisoner KSC2-303 (Tak Sakaguchi) takes off with the girl after his partner is killed and they head into the woods… time to let the no-holds-barred action begin! They fight off seemingly endless zombies with amazing gunplay and martial arts. All the gangsters are pretty badass because you think that the zombies would pose a challenge, but they just destroy them. My personal favourite is the Yakuza Leader (Kenji Matsuda) because he is just completely insane. His movements are wild and crazy but somehow get the job done. The way he delivers his lines are great, too. 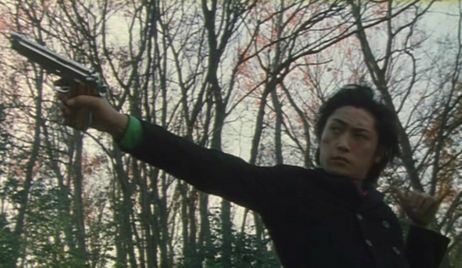 Matsuda said that he wasn’t much of an action star, so he relied more on his acting to make it good. Two other great characters are the cops chasing them. They really have no roles other than comic relief and it’s great. The one cop with the Barrett just randomly spouts off lines about how he’s the best at everything such as being the ultimate martial artist (which leads to a hilarious scene). The other cop has his hand cut off at the start of the film and just walks around like he doesn’t even care! The film takes an even more bizarre turn when the boss finally shows up. Everything starts to fall into place and we soon realize that it’s a film that is really about reincarnation. Also, just when you thought zombies were bad, they now have “Hyper-Zombies”. What are hyper-zombies? Well hyper zombies are like regular zombies but they know kung-fu. Honestly, you have to see this to believe it. This movie also has a great twist ending that I won’t spoil. The special effects really shine in this one. These guys really seem to rip the undead apart with flashy sword and gun play and, I know I’ve said this before, but everyone could learn from this film. Traditional special effects are always going to just look great if done right and you don’t always need to do everything on a computer. The actors and crew on this film had a lot of passion for their work and it shows in the film. They even all got together four years after the film was completed to film new scenes and expand upon others that they couldn’t because of cost or time. Tak Sakaguchi did all of his own stunts and he ended up breaking three ribs and losing a tooth in the process. Another amusing note is that a lot of the actors pulled double or even triple duty cooking meals or doing behind the scenes work. It really goes to show that, although unconventional, Kitamura has some method to his madness. I highly recommend you all check this one out. This entry was posted on April 21, 2011 at 3:51 am and is filed under Horror Showcase, Updates with tags genre, genre films, gore, halloween, horror, horror movies, japan, japanese, movie review, scary, splatterpictures, tokyo shock, versus, zombie, zombies. You can follow any responses to this entry through the RSS 2.0 feed. You can leave a response, or trackback from your own site.